I’ve never really liked clowns. I’ve never really thought they were funny or interesting. As a young improvisor, I sneered at them the same way I sneered at short-form improv and bad sitcoms. I thought I was above it and didn’t even think that there might be something to learn from clowning. I also remember being confused about Keith Johnstone including so much material about masks in his book on Impro. What could possibly be the value in spending so much time working in masks? Things started to change a few years ago when one of my friends in New York, a woman whose creative impulses I greatly respected started talking about how the improvisors she knew needed to learn how to use their bodies more. I don’t know what kind of classes she was taking, but she ended up involved in the clown community out there. I was open to the idea that improvisors needed to do more than stand on stage and say clever things, but I didn’t investigate it much at the time. This summer I went to the Edinburgh Festival Fringe just to see shows and think about what kinds of theatre I wanted to produce. Many of the shows were very physical in ways that I hadn’t ever seen before. The staging of the plays was much more than simple blocking. Often the actors moved in ways that were not the naturalism that I’m used to. One show in particular, the show at which I laughed the hardest, had no words at all. It was just a guy on stage, by himself, doing things and looking at us. It was hysterical and I couldn’t begin to figure out why. 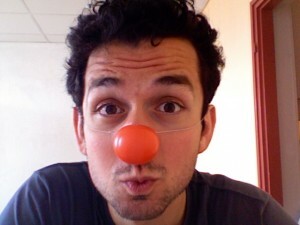 He was a clown, a clown without makeup or a red nose or silly clothes, but definitely a clown. So back in Chicago, I decided to study this thing people called physical theater. I started taking classes with Paola Coletta, who studied at Lecoq and teaches here at DePaul and Colombia. In the first class, we began by learning to be present on stage, to be energized but still neutral. We learned different kinds of movements and then married text to those movements, letting our body determine how we said the lines. We began working with masks, tried to embody different elements like fire and water. We adapted fairy tales as solo pieces. And we started using other masks, some called larval masks and others that were more clearly defined as characters. And something mysterious began happening. Quite often in class, someone would do something and it would be hilarious. It would be funny in a way that few things are. We would be laughing so intensely, it was sometimes hard to breathe. Often the simplest thing could spark this laughter. One person would walk on stage with a mask on. Another would join them and they would simply look at each other and then look out at us and we burst out laughing. What the hell was going on? Some of these interations were more funny than 99% of the improv I’ve seen over the years and I’m at a loss about how to explain it. It’s spooky and little unnerving. It’s also frustrating sometimes. Sometimes it doesn’t work at all. Two people are on stage with the same masks that doubled us over before and we feel nothing. Instead of being interested, we are bored. It can also be frustrating because the work seems so subjective at times. I’m the kind of person who likes his training boiled down into practical guidelines. It’s how I learned to improvise and how I taught it for years. This is much more the kind of work that you have to simply get on stage, let go and play. It’s about fully engaging your body in specific ways. When your wearing a mask, all you have is your body. You can’t express anything on your face, so you have to use your body. Often, you can only barely see the other people on stage. You have to listen much more carefully. You have to trust what you feel is going on. It’s a bit like learning to use a light saber with a blinder on, or swing a bat with weighted donut. Take off the blinder or the weight and you can now play in a much more energized and full way. It’s something I now wish I had explored much earlier. I suspect that many of the people we think of as natural improvisors, the ones who walk on stage and are instantly funny may simply be people who are more naturally in tune with their body. Perhaps, on a subconscious level they know how to be a clown so no matter what comes out of their mouth, we laugh. At least, it seems worth exploring. That’s interesting – I was wrestling with Masks from the book Impro as well, and I finally came to terms with the idea when I saw the movie “Being Elmo” and realized that these people controlling the Muppets like Kevin Clash were doing what Johnstone described as Mask work. But from the way you talk about it, I still haven’t understood it. I still haven’t done it first hand, and I’m still confused but in love with the concept. Perhaps I still don’t get it. I love the idea of an intuitive trance that enters into the realm of improv…but I’ve never experienced it on that level. Know of anyone/any shows out in Los Angeles convincingly pulling it off? Honestly, it’s been a long time since I read Johnstone’s book. And I don’t know if I ever read the mask section carefully. I mentioned it simply to reinforce the idea that I had not been very open to mask work in the past. I have been known to make classes do a hand “puppet” Harold from time to time however. I think there are many ways to use masks. The woman I am working with was trained at Lecoq, and I don’t know what the full purpose is yet. I have some ideas, but I feel like I’m in the middle of my training still. This past week we did a red nose intensive. A lot of the mask work that I had done in the fall helped tremendously. Paola refers to the red nose as the smallest mask. I found it a lot of fun and occasionally hilarious. I’m not sure how to incorporate it fully into improv, but I know it will be effecting how I perform both as an actor and an improvisor. I will ask a friend about LA and see if I can get you a recommendation of who to go see or classes to take.